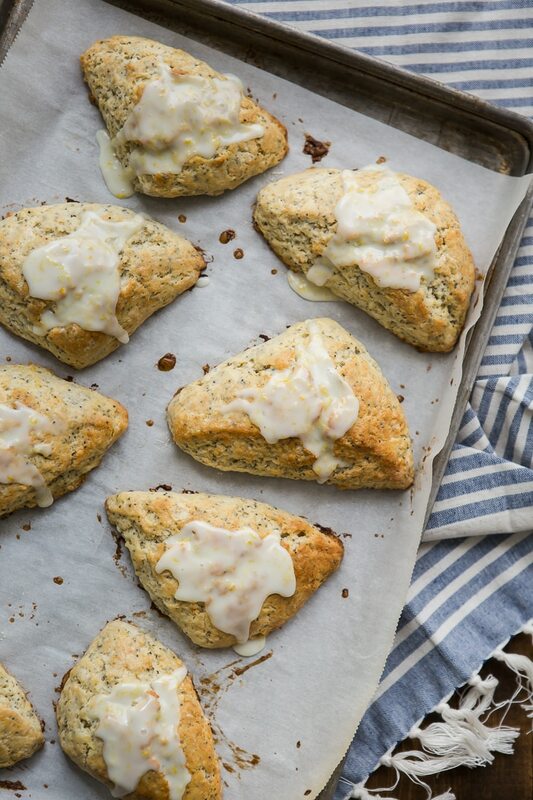 Lemon Poppy Seed Scones | Naturally. Since the beginning of my focus on healthy eating (which is going on a decade-wow! ), I’ve had a major shift in my views on the my definition of healthy (and I say ‘my’ because everyone’s view is different, and that’s okay). When I first started, I sought everything that was low-fat and no-fat, I counted calories like my life depended on it (you can read all about that here), and I found that when I wanted to bake, I was trying to make these treats as ‘healthy’ as a I could. I eventually gave up on most of that because I learned that my body did better on the whole-fats in moderation and if I was going to eat a treat, it was going to be a treat (and not something I had healthified to the extent it tasted like crap and in the end, wasn’t worth it). I was trying to justify keeping these treats in my life on a more regular basis when really it should have been about quality and not quantity. I would take one amazing croissant filled with all the butter every once in a while over croissants all the time that taste rather ‘meh’. This scone recipe is straight from my new cookbook that comes out in about a week (hooray!) While the book is a good chunk of traditional meal inspiration, I wanted to make sure to include items that were more of a treat (reason being there’s an entire chapter on desserts- I don’t mess around, I love my desserts). I stick by the everything in moderation. I worked on this scone recipe for so long because kind of like the croissant, if I’m going to eat a scone, it should be a darn good scone. The outside of these scones are crisp while the inside is still a bit moist (I hate soggy scones). This lemon version is still a bit tart but I find it’s the perfect balance to a hot cup of coffee! Preheat the oven to 425 ̊F (220 ̊C, or gas mark 7). Cover a baking sheet with parchment paper. Place the flour, baking powder, salt, poppy seeds, and lemon zest in a food processor. Pulse until combined. Add the butter and pulse until the mixture is in small, pea-size pieces. Transfer to a large bowl. In a separate bowl, whisk together the egg, heavy cream, lemon juice, and maple syrup. Pour into the dry ingredients and stir until just combined. Turn out the dough onto a floured surface, squeeze the dough a rectangle, about 1 inch (2.5 cm) thick and 3″ wide. Using a knife or bench scoop, cut into 8 squares or triangles. Place the scones 1 to 2 inches (2.5 to 5 cm) apart on the baking sheet. Brush with heavy cream. Bake the scones until firm to the touch and golden, 18 to 20 minutes. Remove from the oven and transfer to a rack to cool. To make the icing: Whisk together the confectioners’ sugar, lemon juice, and lemon zest in a bowl. Once the scones have cooled slightly, spread roughly 1 teaspoon of icing on each one. Recipe from The Easy Vegetarian Kitchen Cookbook. I love your mindset. “Healthy” is such a loaded and complicated word. This scone recipe looks sounds incredible. I’m excited about your cookbook! I know it will be amazing! Yay, scones! These sound like the best treat to eat with a big mug of black tea — or for breakfast. Or for breakfast with some black tea, actually. 🙂 Congrats on your imminent book release — so exciting! Lemon poppy seed is one of my favorite combinations. I love the addition of the maple syrup. Congratulations on the new book!! I love the combination of lemon and poppy seed, this looks wonderful! You can’t beat lemon and poppy seed, and as a scone it’s so refreshing! Some connotations of the word healthy are sometimes not healthy at all! 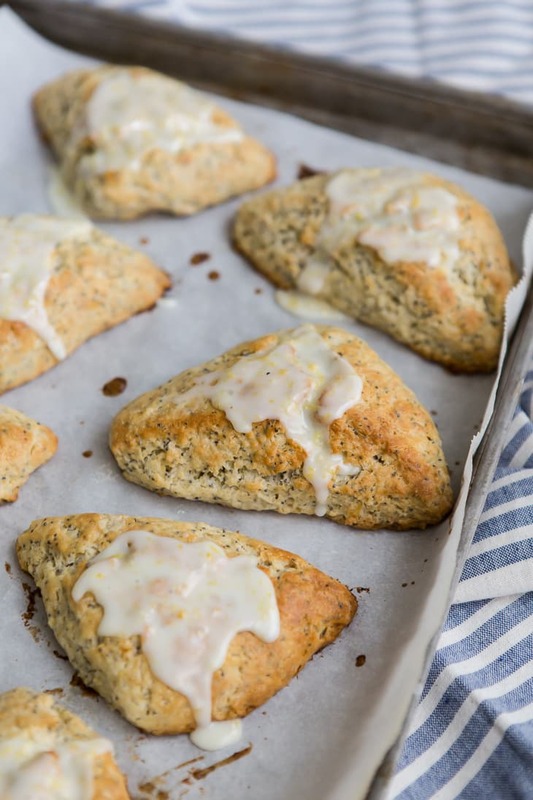 I love the look of these scones, lemon and poppy seeds are a marriage made in heaven. I so agree with your approach to treats and moderation – the “healthy” treats are so often just not worth it. These scones look absolutely perfect and I’m so excited for your new book! The scones look amazing. I can’t wait to try them. I agree. It’s better to have one delicious treat than a quantity of treats that just don’t taste good. These other treats don’t satisfy you and you are still craving a “good” treat. Congrats on your new cookbook. I can’t wait to buy it. Congrats on a new book in the works! What a better way than to celebrate with these scones! these look amazing! I love lemon at spring time. I cannot wait to try these! They look delicious! PREACH! I’m all about moderation as well. It’s so hard to count these calories, eat this, not that, and then feel the guilt when you find out that latte you ordered was 2% instead of non-fat milk. It’s life! Enjoy it! I found that I lost weight when I was eating what I wanted, just in moderation. But I also think different things work for different people. I think this is a wonderful recipe – I too feel that soggy scones are a sin! This looks like a great recipe, I can’t wait to try it! This is my first time at your blog, I’m happy I stopped by! 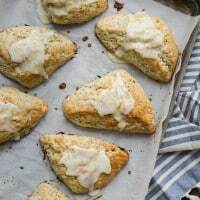 I love lemon poppy seed muffins, but never thought to make lemon poppy seed scones. Brilliant! Also, congratulations on the new cookbook! So exciting!!! I believe in moderation as well. My blog post this morning mentioned my 90/10 philosophy (which sometimes ends up being 80/20). Eat well most of the time; splurge occasionally. These look like a healthy type of splurge — my favorite kind! I’m thinking they may end up on my Mother’s Day brunch menu! Your scones are going to be the rave review of board meeting this week!! Your philosophy is a perfect ‘fit’ to my way of baking!!Thanks!! I will try this for breakfast with some black tea on next sunday! These look delicious! I’ve tried a lemon poppy seed muffin recipe and used chia seeds instead. It worked perfect. I bet it would work with these as well. OMG…Looks so tasty and yummy….would give a try on weekend. Can’t we add salted butter in this? Because I like Salted butter more than unsalted butter. these look amazing! I love lemon at spring time. Thanks for the post! These look/sound amazing! Yumm! Will be trying with my friends this weekend! Mouth watering, just can’t wait to try them out. Thanks for the write up. ?